Everything is 'on-campus'. The Course is fully residential. 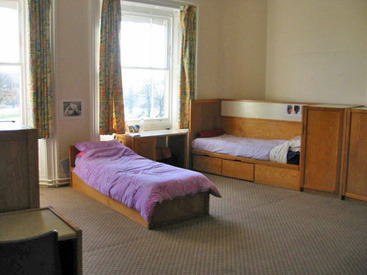 Students aged 10-13 are usually in dormitories of 3 or 4 in Howard House. Students aged 14 and over live in the Manor House or one of the other buildings on the campus. Bedtime is at 22.30 although it may be extended to 22.45. Students can express a preference although the final decision is made by the school. Returning students can ask to be with friends. We provide bed linen. This is washed every week. Clothes are washed twice a week.